Moorestown has the talent in place to make a run at its second straight state championship and the program’s 19th overall. The Quakers might not even have to go to the dramatic lengths they had to last year. They captured their first state title since 1999, winning the Public B crown over Princeton in the meet’s final event. That victory capped a perfect 17-0 season. Moorestown—which has been moved to Central Jersey for sectionals—will build its title defense around a pair of two-time individual state champions in senior Zach Fong and junior Alex Martin. Fong, a University of Virginia recruit, brought home titles in the butterfly and 500 free, while Martin won in the IM and backstroke. Another traditionally strong program—Cherry Hill East—had a memorable season in 2014 as well, winning every meet until falling to Westfield in the Public A state final. The Cougars finished with a 14-1 record and won their sixth straight sectional crown. This year should feature more of the same with a returning cast that includes senior David Rowe, who placed seventh in the butterfly and eighth in the backstroke in the state. Also back is senior Ethan O’Neill, who has placed first, second and third at the state diving championships in his first three seasons and should be in store for a terrific end to his high school career. Lenape graduated a strong senior class from a team that went 10-2 and reached the South Jersey Public A final before falling to Cherry Hill East. But a lot of talent remains, led by one of the area’s best swimmers in senior Steve Shek, who placed second at the Meet of Champions in both the 200 free and 100 breaststroke. Like Moorestown, Lenape has been moved to Central Jersey but will remain in Group A.
Haddonfield, which lost to Moorestown by a mere two points in the South Jersey Public B semifinals, will be led by juniors Brenden Finnegan (IM, butterfly) and Tim Proctor (500 free) and seniors Mike DeFeo (50 free; pictured) and Danny Stevens (backstroke), who all placed in the top 10 in their events at the SJISA Coaches Invitational. Tri-County Conference powers Clearview and Gloucester Catholic are also in store for more success. The Pioneers went undefeated in the conference and won the Gloucester County title. They are led by senior freestyler Hunter McNamara, who was second in the county and fourth in the conference in the 100 free. The Rams went 8-2 and claimed the Tri-County Classic crown. 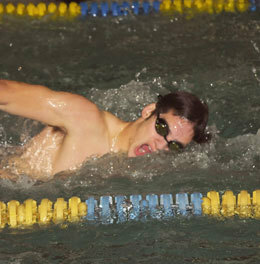 Junior Max McCall leads a strong returning cast after winning the 200 free title at the Tri-County Championships. Head coach Kevin Nolan, entering his 28th season, also welcomes in a promising freshman class. Bishop Eustace joined Gloucester Catholic in the Non-Public B playoffs despite having just 11 members on the team. Sophomore Matt McGough leads the returners after earning all-conference honors in the 100 and 500 free as a freshman. Shawnee welcomes back one of the top butterfliers in the state, as senior Jon Burkett took third in the event at the Meet of Champions and was named all-South Jersey first team. He is joined by a solid returning cast and talented freshman Brenden Meagher. Washington Township saw its streak of 12 straight Gloucester County team titles come to an end, but the Minutemen certainly have the returning talent to start a new streak. Seniors Brandon Seigel (butterfly) and Nick Cianci (diving) and junior C.J. McAninley (100 free) all won their second consecutive individual county crowns. Junior Carlos Obregon, who took fourth in the butterfly and fifth in the backstroke at the South Jersey meet, is one of the top swimmers for Cherokee. Senior Brandon Beach leads the way for Moorestown Friends, who went 3-5 last year and took fourth at the Friends School League Championships. And Eastern has a promising sophomore in Jerry Joyce, who placed 10th in the breaststroke in Division A at the SJISA Coaches Invitational.